Finally had the time to sit down and capture the most important lessons in my life thus far! Hope you enjoy! Lesson 1: Be authentic– I stopped trying “fake it until I made it.” Yes, this works for some but I didn’t feel authentic or genuine. I felt like I was trying to be someone else or someone I wasn’t. There isn’t much glamour in my life but I’m happy, loved, and blessed. I’m overly emotional all the time, Im sensitive, I goofy, and I love hard, but that is who I am, I can’t change that and I don’t want to, it’s what makes me “Lee”. Lesson 3: Choose happiness– If it doesn’t make you happy, don’t do it, whether it is a situation, person, or job. Lesson 4: Make it last – Cherish what ever you hold dear and keep it close. Lesson 5: Forgive– You don’t have to forget but forgive. Never spend too much time holding grudges. It’s never your battle to fight. Lesson 6: Make yourself the only competition- Just because you do it slower or faster than someone else doesn’t mean anything. It’s your life go at your pace. Lesson 7: Make it impossible for them to steal your joy. – Never let them catch you slipping. Lesson 8: Keep them guessing – Keep it ambiguous everyone doesn’t need to know how you do it when you do it or the manner in which you do it. Lesson 10: Smile– Smile often, you would be amazed at how much it changes your day. Lesson 12: Plan it– A goal without a plan is just a dream. Lesson 13: Do it– You planned it now do it! Lesson 14: Fear is just a word- Fear is just a word- It has no holding, conquer it! Lesson 15: Love – Love hard and without regrets. Lesson 16: Be Kind always– You never know what hell someone else is going through. Lesson 17: Perception is reality- How you perceive something is how it will elevate you to another height or keep you grounded. Lesson 18: Protect your heart– Guard it above all else because you only get one. Be careful who you let hold on to it. Lesson 20: Build your brand- My favorite quote is, “Your smile is your logo, your personality is your business card, how you leave others feeling after having an experience with you becomes your trademark.” – Jay Danzie It’s important to know how others perceive you. Lesson 21: Keep GOD close- Mediate and pray daily even for at least 5 minutes. Lesson 23: Grow- once you accept change you can grow. Yes it is painful at times but necessary. Lesson 24: Be proactive- Close mouths don’t get fed. If you want it go get it! Lesson 25: BE YOU!- I be learned not to bend to a stereotype or what society thinks I am. I the only Carletha and I m going to set out to be the BEST version of me I can. 25 don’t owe me anything. This past year has been a whirlwind of emotions and I would not change anything for the world. 26 whatchu got for the kid?! Anything that you are passionate about, see a future in, or hell even take interest in you stake a claim you place a title on, a definitive person, place, or thing that has and association with who you are as a person. You have been apart of this other person life daily routine and assuming sexual activities for a while but what your saying is that this person has no definitive stake of claim in your life. This person your just existing with. Now i don’t know about anyone else but I m not just going to exist with someone that’s a waste of time energy and emotions. Yet we still do it. We still exist with no title no claim, like lost baggage at an airport. My 2nd question is how you are you ever going to get to the next phase in the life of the relationship? Do you go from existing with each other to married? Where is the bridging and merging of one? I never understood this. My 3rd question is how do want the other party to be loyal and only “ride for you” if there is no commitment of title? Does a NBA play for a team without a signed contract outlining his duties and what is expected of him? No so why would any party but there all into one person with out any guarantee that there will be some type of definitive role? I ask these questions because I probe you to ask them yourself. Not having a title seems harder than actually having one. Setting clear expectations, and outlines of duties are always a roadmap for success so why aren’t you doing that for your love life? Describing the noun trust is always hard. You state the definition but it carries more weight than the actual words that define it. I guess what I am trying to say is that trust has no real definition, it has a defining moment, that moment when you either do or you don’t there is no between. Trust is a delicate thing. I envision it as a small piece of fine china, its hand-crafted from the finest materials. You have no idea why this small delicate object cost so much money but you know it’s worth it. If nurtured properly you are able to pass it down for generations. If it falls into the wrong hands it ends up damaged, chipped, or broken beyond repair. You try to mend it fix it but you know in the end it will never be the same valuable piece it was when you first purchased it. Once broken or betrayed it carries the weight of the world. Someone can work for years to gain the trust of someone and in seconds it is destroyed, unfixable beyond repair. You can say “Let’s wipe the slate clean or let’s start over” but in reality you’re not. You are merely trying to fix what was broken instead of starting completely over and saving for a new piece of china (trust). It might be dinged a little or scratch but you know it will never be the same again. My experience and journey is far different from yours but what I have learned throughout this journey is that once someone has betrayed your trust beyond repair it is time to call it quits. Easier said than done I know, but having the self-awareness to know that it will never be what it once was will save the heart ache and head ache in the long run. You’re going to continue to do a comparable study before the trust was betrayed and after. Let’s just be completely honest and candid with each other everything that person says you’re going to take with a grain of salt anyway because you will always have this thought in the back of your mind nagging you constantly. Throwing away something that is broken is necessary and needed at times. Throwing or breaking something that is perfectly fine is a different story entirely. Trust issues plain and simple. You’re talking to someone who has done nothing wrong. Nothing to lead you to believe that any trust that you all have established has been betrayed or broken. HOWEVER you treat it like it is. Your hesitant, skeptical, unsure, scared that THIS situation will end up just like THAT one. Letting your past experiences change your perception or cloud your judgment. So you search for something wrong you start to dig and try to find something. Ask yourself WHY? It’s certainly not because of them. From what they say and what they show everything seems to be matching up so WHY are you digging? You’re digging because of the past. You’ve been so hurt and so betrayed that you willing to ruin or break something that doesn’t need fixing or is brand new. You’re trying to find reasons why this won’t work out trying to catch them in a lie instead of giving them an honest chance. We as humans are born selfish. Have you ever stopped and thought that the other person is feeling THE EXACT SAME WAY you’re feeling? Scared, uneasy thinking that this is going to fail before it even begins? Are they digging? Are they trying to shatter an expensive piece of china? Odds are they are not. So yes trust is a huge thing. To place all your hopes, wants, expectations and dreams into ONE person is scary. HOWEVER, it’s necessary, it’s necessary in hopes to find the one, to fall in love again and experience something honest and genuine with someone. So I challenge you, next time you get the urge to smash a brand new piece of china don’t. Fight the urge let that person earn or break your trust don’t do it for them. If you don’t you have never truly moved on from your past or present, your running and you will never have a fulfilling future. After your initial excitement of getting what you have been praying for quite awhile there comes a lull period where you find yourself in a growing pain of some sorts, where things are good but not as great as you thought; the “adjustment period” so to speak. How do you adapting to what you are currently experiencing? Find a balance– you may seem unbalanced or off in a sense. Remember nobody has ever had too much of a good thing, however, you may think so. Learn to find a healthy balance between everything that is new and exciting in your life and what you is old, dependable and comfortable to you. Keep in mind that all things are have been dependable in your life should STILL be dependable and stable, you do not need to nurture those things as much as much as what is new in your life. Do ever make the mistake of putting your blessing on the back burner. Change your thought process- GOD wouldn’t have given you this blessing if he didn’t think you were ready. Now that you are ready you much change your thought process in order to fully take on the blessing that you have. It’s called growth and we can not truly experience life without it, so GROW and Change how you think in order to fully receive your blessing. Your blessing is YOUR blessing– everyone isn’t going to like it or understand it. I grew frustrated over the weekend because this was how I felt. I had to remind myself of the 1st three, I found the balance and I made an honest effort to make time, find time, and plan time but for whatever reason it did not work and that isn’t my fault. I have to accept that. Over the past couple of months I have changed and I’ve realized that it isn’t a bad thing it is just preparing me for what is to come. Success comes with preparation and opportunity meet, I am preparing for my next success and there is nothing wrong with that! People say That failure isn’t an option. 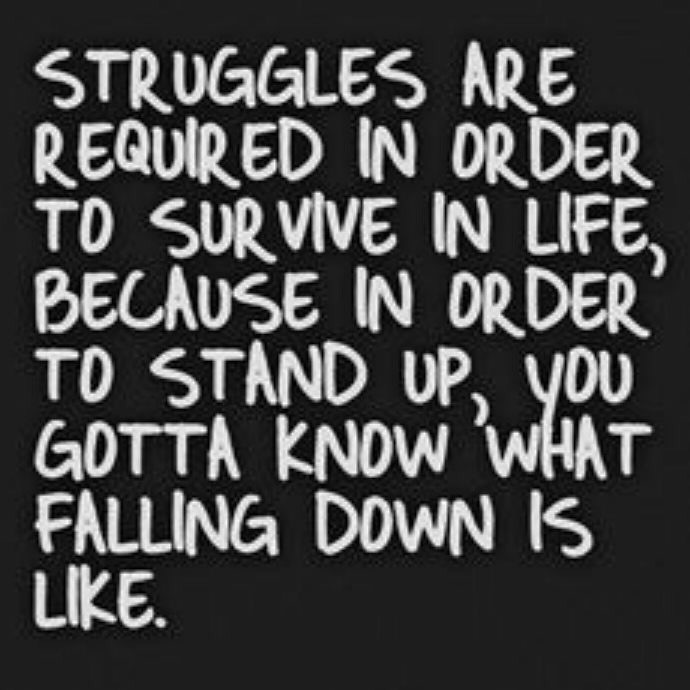 However how do you understand and appreciate your successes if you don’t know what falling face down feels like? Accept that you are going to fail– Oprah at 23 got fired as news reporter . During Fed Ex up and coming days they didn’t even have enough money to fuel the plane to deliver packages at one point. Every great or powerful person has experienced the “I got 5$ until the next pay day struggle.” You are not in this alone. Just because you fail don’t rethink your purpose– overthinking and rethinking is normal in when you fail. You think to yourself “Is this really what I am supposed to do? Am I really cut out for this?” Yes you are! Quit second guessing yourself! Treat your failures just like your success– what I mean by that is appreciate them because they all have a purpose and a meaning. Learn from them so you know what not to do and teach others what you did wrong so they don’t. Lastly SHARE your failures just like you share your successes. You never know who you are going to touch or who you will inspire. Because of YOU they didn’t give up! #007 goes to my failures thank you for the lesson you taught me to make me a better woman! We have to the break habit. In order to change your current situation you have to change your thought process. Three things I ve decided to change. 1. No social media the 1st hour of the day. Start the first hour of your day with a podcast, meditation, exercise, music, anything but social media. What and how you spend your hour of your day doing dictates a lot of your day. I mediate for 10 mins and then listen to music to get me pumped up for my day. 2. One positive a day. My LSs and I have started sharing one positive a day. It makes you think about a positive or something of value that has happened during your day. 3. “Small words big impact”. Which means if someone says something that applies to me and they don’t know it it means that God wanted me to hear it so I have to act on it. It’s the small things that make the biggest impact. Break the habit! Who you follow on your social media says a lot about what you. What you put look at everyday you feed into your mind, body, and your ideology on life. My news feed is a mixture between the fitness inspiration, other bloggers, forward thinkers, small business, and people who provide me with daily light, energy, and positive outlook on life. I m thankful for all the people who provide just a positive Light Energy and Outlook on everyday life. This post is just to say thank you. I am a hoarder and I admit it, I always start the excuse with “it was only”!!!. So not I ma cleaning out the clutter of my life and my closet. If I haven’t worn in it in the past 9 months I am chucking it. I keep holding on to stuff in hopes that maybe it may come back in style… NOT. I am on duffle bag 3 and feeling free. No longer do I have to intentionally leave clothes dirty because I do not have any room for them! I had a great dialogue with some of my amazing friends this weekend. They gave me a great tip. “No Cellphone for the 1st hour of your day” Sounds simple enough right? It goes back to my reason 00 you have to be careful what you let into your space and ideology especially in with in the 1st hour of the day. So I tried it, as soon as I wake up I set and additional alarm an hour away, letting me know that it is ok to utilize my phone. I am 3 days in and for the past 3 days I have started out the day more productive than previously. Yay for self improvement!